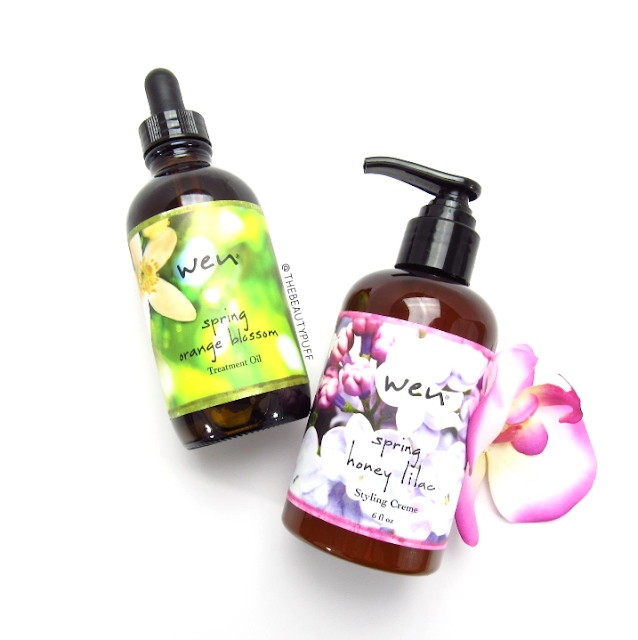 Lately I've been loving Wen's scent in Spring Honey Lilac. This isn't the only spring-inspired scent from the line, however. They also have Spring Orange Blossom which smells incredibly light and fresh. I have the Spring Orange Blossom Treatment Oil and Spring Honey Lilac Styling Cream. I've been enjoying both of these refreshing scents in my morning beauty routine. Styling Cream | This cream is great multi-purpose hair product. It provides light hold, protection against frizz and heat, and also keeps hair shiny. My hair is really soft and fluffy after using this cream. I apply it to my damp hair, "scrunch" my waves a bit, and let my hair air dry. It's not sticky and doesn't weigh my hair down so my waves look bouncy and natural. It's a great "no-fuss" hair product for this time of year! Along with the benefits this cream provides my hair, I just love the scent. I have the matching perfume and love the floral smell for spring and summer. You can read my feature on the Spring Honey Lilac perfume here. Shop these and more products from Wen, on their website below!